Field Notes from Biologist Cathy Beck: New Uncharted Territory! You Eat How Much Each Day? Welcome back to Biologist Cathy Beck and her colleagues at The Sirenia Project for a fifth season! Every year Cathy and the team have let us in for a rare look at manatee research as it happens. We're grateful for the opportunity to follow along again this year as they conduct their important research on the endangered Florida Manatee. "Hi students! I'm glad to be back with Journey North, and glad that you can join in our latest research projects.All of our scientists are back again too--Bob Bonde, Jim Reid, Susan Butler and Dean Easton. "Right now, we are out capturing, tagging and releasing wild manatees in a whole new unexplored area! It's called Ten Thousand Islands (25.700N, 81.300W) right along the western edge of the Everglades, and we hope to tag 10 manatees here. 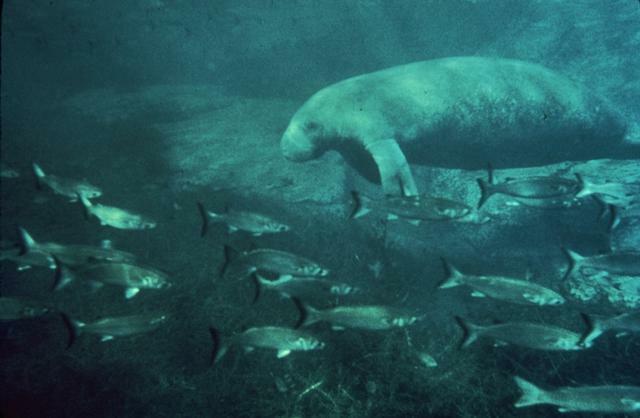 "We are just starting to learn about manatee movements in this area. It's all part of a study related to the Everglades Restoration. We anticipate some very interesting movements, especially during mild spells as spring approaches. So watch for big news on the new manatees that we tag! "While we wait for news from the "Tag Team", you can begin tracking "Surfer", who is among the first manatees we tagged already for this study. She is an adult female manatee who was tagged and released last June, after being rescued from exposure to the red tide toxin. Surfer's data is below, and we'll have more on her in the coming weeks too." "Can you figure out where Surfer was released? Using the latitude and longitude provided for 6/22/00, name the nearest large coastal city." "Using Surfer's latitude readings, can you determine how far south she migrated between June 22, 2000 and January 1, 2001? Between November 22 and 26, 2000? During these November 22-26 dates how many miles per day did she travel on average?" "Can you explain WHY Surfer might have moved WHEN and WHERE she did between November 22 and 26? Plot her travels between those dates. Then find Florida on the weather maps and study them for the dates November 19-22"
Click to map to enlarge. "We hope to have captured more manatees for tracking by the next report! Until then, this is Cathy Beck"
Go behind the scenes and meet Cathy, Bob, Jim, Susan and Dean. IMPORTANT: Answer only ONE question in each e-mail message. 3. In the body of the EACH message, give your answer to ONE of the questions above.